The Pecha Kucha 8 deadline for submitting a presentation is just about to expire, and while I’d love to speak about the epicurean world, I don’t think I had enough time (or was mentally prepared) to really show bread (or food) its due diligence. Hopefully I’ll be able to get a better grasp at what goes down at these events by actually attending PK8, and figure something out for PK9. Either way, it’s Friday, so you might as well dance…or at the very least, go enjoy the Edmonton International Fringe Festival! I don’t remember Operation Fruit Rescue from last year, but if it’s just slipping my mind at the moment, I’m happy to learn about it all over again. A brilliant initiative that allows for volunteers to pick fruit that the plant and tree owners may not be able to. Pickers receive 1/3 of the fruit, owners 1/3, and maybe best of all, the final portion goes to the Edmonton Food Bank! Seeing that local real estate mogul, fund-raiser and all around good guy, Jerry Aulenbach, has been selected by Delux Burger Bar as the November guest burger creator, makes me smile. I have a feeling the burger is going to include…what is the word…you know, that thing..from the thing…oh yeah. BACON. To stay on bacon for another minute, why not check out these 17 random bacon facts. Who knew the average American eats 17.9lbs of bacon in a year. Liane Faulder mentioned that her upcoming Celebrity Chef article (a great series of interesting locals) will be focusing on Ryan Jespersen and Kari Skelton. With BT Edmonton part of my wake up routine, I’m pretty excited to see what Ryan and Kari can put down. The potential for a new farmer’s market is in the works. It looks like it’ll be located in the southwest portion of your city and in proper tech fashion; the group is utilizing twitter to grow the word. As well, if you are feeling creative you can throw in your suggestion for their catchphrase or slogan here. There has been so much talk about food carts lately; that it’s no surprise to hear another vendor is going to open up. I’m going to put myself out there and say that I’m a little sad to discover it’s another hot dog vendor. I will continue to hope that one day, regulations and restrictions will be reworked to allow for the cooking of raw meat and other products in the open. Heck, look at what they do in Hawker centre‘s (where policing of health is very intense) or the amazing street side setup’s in Portland. From all of the twitter talk, it seems like Slow Food Edmonton’s Beer & Boar BBQ was another hit. I’m sure local blogger extraordinaire, Sharon Yeo, who was one of the main minds behind the event, will have something up for all of us who weren’t able to attend. **Link Here. There was a nice little write-up in the Edmonton Journal this week about a dutch bakery, aptly named, Dutch Delicious. Located on 118th Ave, just west of St. Albert Trail, the bread baker in me is craving a visit. Sarah picked me up a cookbook from 1932 this week. Always a sucker for such things, we shared a few giggles looking through the book and I’ve already attempted the PB & Banana Pinwheels. Stopping at Old Country Meat & Deli last week, before butcher and owner Todd went on vacation (shakes fist), I grabbed a fresh package of applewood bacon(top) and his latest version of English back bacon(bottom). Seriously delicious. Seriously addictive. Another business lunch last week meant another visit to the Gazebo Cafe at the Royal Executive Inn in Nisku. While the service proves to be dry, I’m consistently impressed by the cornucopia of goods available here, including the ginormous dessert selection. Adam Richman, Man V. Food, attempts to take on the Ultimate Destroyer Challenge this week; This six and a half pound platter consists of one and a half pounds of fries and a five-pound hamburger made up of seven different types of smoked meats. Adam has 45 minutes to be the first person to ever complete the biggest sandwich in Kansas City. In case you can’t guess from the ridiculous amount of food and short time period; Adam does not conquer this meal. Anthony Bourdain, No Reservations, was in Dubai this week. For a country that has exploded in the last 15-20 years, I’m almost speechless about what to say. It would have been something else to witness it first hand. Plus you can ski all year round…. Sarah and I will be in San Francisco this time next week, which means I’m not sure how my updates are going to unfold. So you’ll have to bear with me as I try to blog from the road, and enjoy my vacation at the same time. As well, you still have a few more days to pass on any San Fran suggestions; places to visit, things to see, and maybe most importantly, things to eat. You just said the magic words to me…San Francisco! As a foodie you must (MUST) go to the Ferry Building – my husband and I always stay a hotal across the street because we are there every day! It has everything…the BEST olive oil (Stonehouse) I have ever tried (we usually lug several bottles home because we can’t get it here). They have samples available at the store. Gott’s (formerly Taylor’s Refreshor) is a great burger place (try the Wisconsin Sourdough – you will not be disappointed!). Stop in at Acme Bread Company, the Cowgirl Creamery & Boccalone Salumeria and you’ve the makings for a fantastic picnic. Delica is a great, fresh Asian deli. And for sweets – the Miette Bakery has the best lemon shortbread cookies and chocolate pot du creme, and Ciao Bella Gelato for (obvs) gelato. And they have a GIANT farmer’s market there every Saturday with many food carts. From reading your blog, I can’t imagine you not loving it. Thanks fojoy. I’m definitely going to have a gander at your suggestions, and yes, I’ve already planned a visit or two to the Ferry Building. 1. A macaron at Miette in the Ferry Building. Life changing. 2. Cha! Cha! Cha! was great, cheap Mexican. Mission and/or Haight. 3. Bi-Rite Creamery. Mother-effer. I cannot even explain how good this is. I’m sure you’ve heard/read about Bi-Rite. Whatever you’ve read is inadequate. It’s in the Mission, and worth every effort to get there. We did twice. 4. Taqueria Cancun. In the Mission again. Really, please take a day to spend in the Mission and Castro Districts. So cool. Anyway, we had the veggie burrito, and had to split it. It’s about $5, and will easily feed you both for lunch. We took a picture next to a pop can… it’s got to be three times the size. 5. Not food, but Self-Edge (Mission!) is the coolest store in the world if you need a new pair of jeans; these aren’t $39 Gap jeans though. 6. Do Alcatraz. It’s awesome. Get tickets in advance. 7. Try some sourdough. I don’t know you but, based on this blog alone, I’m sure you’re planning on it. 8. I drank a lot of Anchor Steam, since it’s brewed locally. 9. Garlic fries if you go to a Giants game. I’m an A’s fan, so I shouldn’t say this, but the Giants have a beautiful park. About Portland. Portland is my favourite city ever. I’d highly suggest a vacation there if you’re a food/beer/coffee fan. It’s incredible. Stay at the Ace, and be ready to eat. Lots to do to, especially if you’re adventurous enough to rent/bring a bike. Have an amazing trip in SF!!! Eat a lot and have a lot of fun!! Have you gone yet? I did post a bit about our trip there last August. How long will you be there… Alcatraz must be booked in advance – OR you can buy a package of tours and get one…better to book ahead. Ferry Building on Saturday – go early – go hungry. but, I am telling you nothing new. We did a foodie tour of the North Beach area and loved it… got to hit the bookstore there. Oh, so many things to do…. we were there 10 days and only scratched the surface. 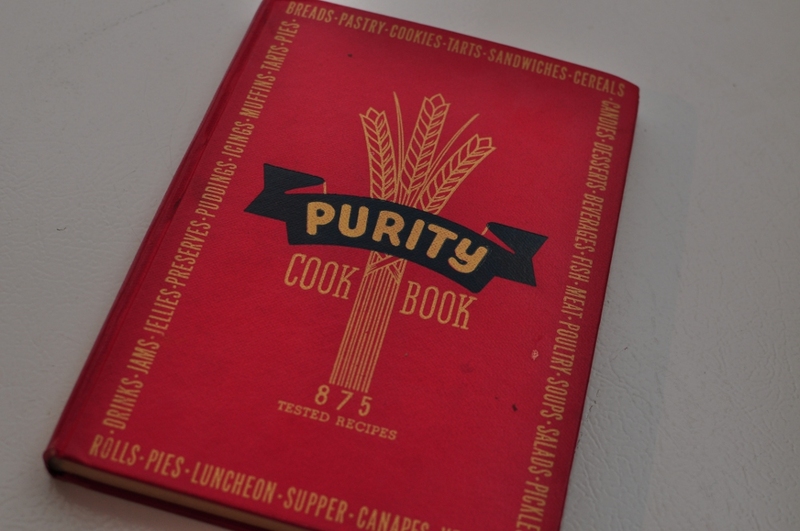 Just stopped by and was pleased to see the PURITY cook book. My mom’s is still around somewhere in her cupboards.This was the first ‘grown-up’ cook book that I was allowed to use (circa 1960’s–me not the book–it’s older than me). Best recipe from this book was the success I had then with the biscuits. 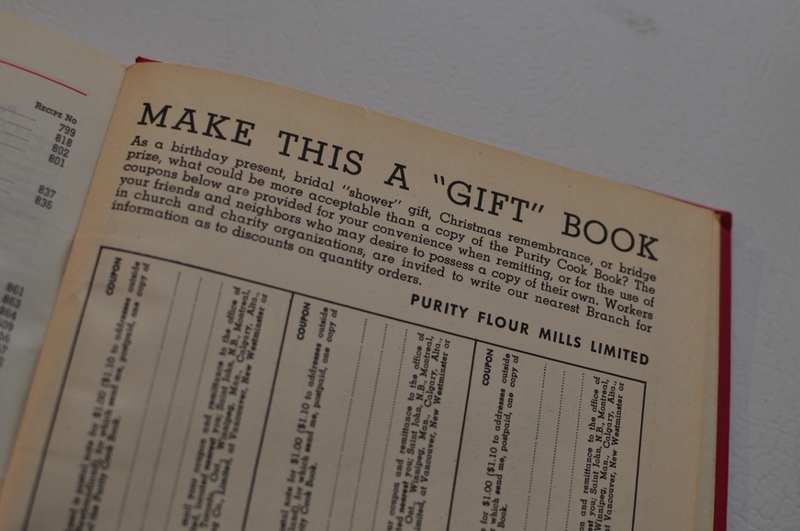 Since mom’s in her 80’s now and not cooking much, I may ask for the book for my kitchen.